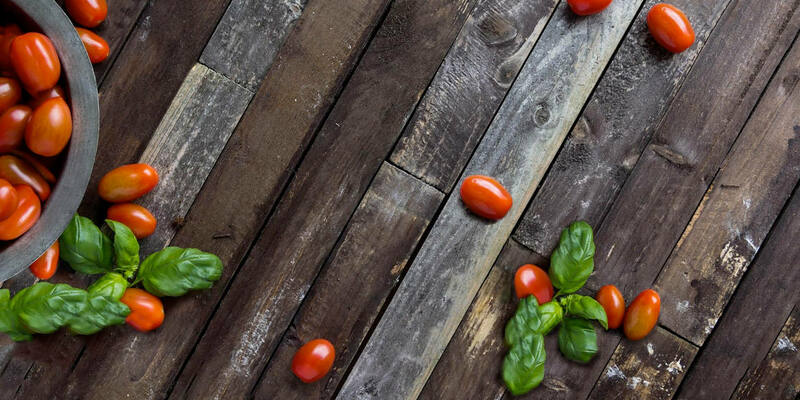 If you’ve been following the PCOS Nutrition Center blog, you know what a fan we are of a combination of myo and d-chiro inositol (DCI) for pretty much any woman with PCOS, regardless of age or fertility. 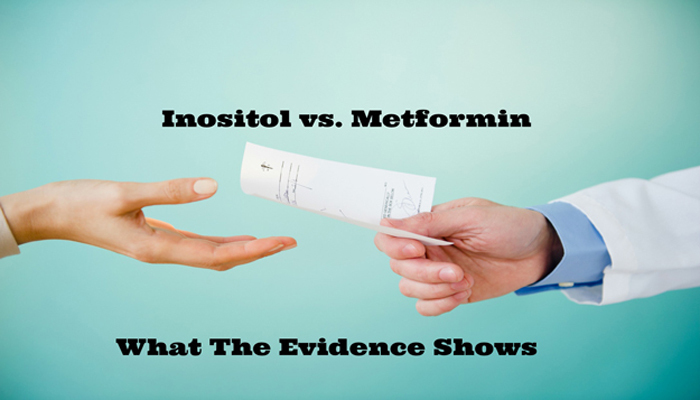 New research is starting to compare the benefits of inositol to metformin in women with PCOS. The results may surprise you! Inositols are secondary messengers. The best explanation of this that I give to my PCOS nutrition coaching patients goes like this: when we eat foods (mostly carbohydrates), they get converted into glucose in our blood stream. We need the glucose to enter our cells to be used for energy. When blood glucose levels rise, a signal (imagine a doorbell is rung) is sent from the cell door to the nucleus telling it to open up. However, with PCOS, the doorbell on the cell door may be defective. This means that it takes longer for the cells to open its doors to glucose resulting in higher amounts of insulin needing to be secreted. Secondary messengers acts to repair the doorbell so that the cell doors open in a timely response to glucose, resulting in less insulin needing to be secreted. 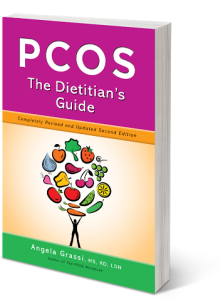 It has been suggested that women with PCOS have a problem converting myo into DCI (myo inositol gets converted into DCI when needed to maintain a 40:1 ratio in tissues). Supplementing with too much DCI (over 600 mg or more) was actually shown to negatively affect egg quality. That’s why it’s now recommended that women with PCOS supplement with both myo and DCI in a 40:1 ratio, that mimics the body’s natural physiological levels. We recommend Ovasitol, which is a tasteless powder you can put into your favorite beverage. How Does Inositol Compare With Metformin? Metformin has always been the go-to drug of choice for women with PCOS. The majority of women with PCOS have insulin resistance, a precursor to type 2 diabetes. Doctors figured the most popular and well-studied diabetes drug, metformin, can help PCOS too. And it does! Metformin can reduce insulin levels and perhaps reduce the risk for type 2 diabetes. Metformin can improve the regularity of some women’s menstrual cycles, helping them to conceive. Metformin works to decrease your body’s production of glucose. In contrast, inositol works right at the cell wall to open its doors to glucose. Since inositols are showing great results in women with PCOS (again, women with PCOS may have a defect in their ability to use inositol which could explain why so many women have insulin resistance in the first place), it’s being studied more and compared to metformin. So far (although more studies are needed), the results are in inositol’s favor. The most recent study out this year, 128 women with PCOS took 1500 mg metformin or myo + d-chiro inositol (in a 40:1 ratio) daily for 3 months. The results: Myo + DCI showed significantly better results in weight reduction, ovulation, and pregnancy rates (46.7% vs. 11.2%) than metformin. In a previous randomized controlled trial, 120 PCOS women trying to conceive took 1500 mg metformin vs 4 g myo + 400 mcg folic acid daily. Their results: women who took myo inositol had a better ovulation (65% vs. 50%) and pregnancy rate (30% vs. 18%) compared with the women who took metformin. Both these studies show encouraging news for inositol being a promising first-line treatment for helping women with PCOS conceive and reduce insulin. Inositol is a good for those who can’t tolerate the side effects of metformin (inositol can also be taken with metformin for those who do tolerate it). Personally, I saw and continue to experience, great results taking a daily combination of myo and DCI. I was skeptical at first, but given the large amount of research I discovered about inositol while writing the supplements chapter in PCOS: The Dietitian’s Guide, I figured it was worth a try. I am so glad I did! I’ve been on metformin for years and it has slightly helped to reduce my risk for type 2 diabetes by keeping my HA1C (a measure of how well glucose has been controlled over the past 3 months), stable in optimal ranges. When I first started inositol, my HA1C was 5.4% (pre-diabetes is diagnosed when HA1C reaches 5.7% or higher). After 3 months of taking inositol, my HA1C dropped to 5.1%. Six months later it went down to 4.9%. Nothing else changed. I (as well as my physician) were shocked. Metformin never lowered my HA1C like that for me. I continue to take both metformin and inositol and my HA1C continues to be stable around 5%. My patients who take a combination of myo and DCI see a reduction in cravings, less hunger, and some get their periods back and more regular within a month (3 months of use is recommended for full effects). Typical dosage of Ovasitol is 2 packets each day (4 grams myo inositol total) in two divided doses. We recommend taking ovasitol with meals for maximum benefits. Ovasitol is well tolerated. As always, consult with your doctor prior to use. Only take inositol or any dietary supplement while under the supervision of a health care provider. Tell us! What benefits have you seen by taking inositol? Hi, I’m wondering if you have any thoughts about Pioglitazone and PCOS? I recently switched from Metformin to Pioglitazone for my IR. So interesting…will definitely start to recommend to my PCOS patients! My question is, does it have the same insulin sensitizing effect on those without PCOS? Those with type 2 diabetes and prediabetes? We don’t know yet how inositol works for those without PCOS. Women with PCOS have an intrinsci insulin resistance that is different from those with type 2 diabetes or obesity. Since it can reduce Ha1C levels, it’s worth trying it. Several years ago after reading articles about Inositol, I purchased and tried D=Chiro-Inositol by Chiral Balance. It was very expensive and after my initial 3 month trial, I didn’t see any positive changes from using it. Their site recommended longer use was possibly required to see results, but I wasn’t willing to put out that much money again. Earlier this summer I began reading articles from PCOS Nutrition Center and came across an article regarding Inositol supplements. I had already begun using an over the counter Niacin supplement by Radiance from CVS earlier in the year, which had helped me lose 10 lbs. Seeing results I was more open to trying further Inositol supplements and the explanation of the effectiveness of the Ovasitol brand made sense. Since using this brand, I’ve been able to drop another 10+ lbs. I’m at the lowest weight I’ve been in over 20yrs, since I had my oldest child. I’m still very much overweight, but to me it’s the most amazing thing! I’ve also had my yearly checkup and through the use of Inositol supplements, I’ve lowered my HAIC and my cholesterol levels, which are well within normal limits. Last year at my annual physical, my cholesterol was elevated and my physician wanted me to consider taking a cholesterol lowering medication, which I declined. I knew/know that my cholesterol is directly related to my PCOS and how well I can keep my PCOS in check. I’m constantly looking for new possible holistic treatments in addition to my metformin preion. I’ve had to manage my own treatment of my PCOS, because the only treatment ever suggested to me by any physician was metformin. Thru the years by reading various articles, I’ve added multiple supplements to my regimen. I’ve also diagnosed myself with low vitamin D and B12 levels, which I had confirmed by blood tests that my physician ordered. Thank goodness we live in a day and age of the internet, where we have the opportunity to research for ourselves, because without it, I would not be able to care for myself! Unfortunately, due to the lack of knowledge and concern in the medical field to diagnose and treat PCOS, you have to be your own patient advocate! Hi, I’m just trying to learn about PCOS,being recently diagnosed…I was just wondering if I currently don’t have excessive hair growth and weight gain, will I stay this way or get new symptoms as time goes on? thanks for your comment. If you don’t already have symptoms, your chances are lower of having them when your older. In general though, PCOS symptoms tend to get worse with age if PCOS is not well managed. Really helpful fpr me, i’m struggling daily to keep off the sugar. I try to exchange candy with healthier options like sweet vegetables and fruit. Also working on cutting out dairy and gluten. Thanks for an awesome page! Thanks for great notes.My question is.can someone intake Myo inositol along with metformin. You can use it with metformin, although we recommend Ovasitol which doesn’t contain folic acid (up to 60% of women don’t metabolize it) and has the ideal 40:1 ratio of myo and dci. Ovasitol is cheaper than pregnitude as well. I have PCOS and my fertility doctor told me about Ovasitol because I was not interested in starting Metformin. Unfortunately I only started drinking it a week before conception, so I can’t say if it had anything to do with us being able to become pregnant. I had started a grain and dairy free diet a few weeks before, so I actually credit that with conception rather than Ovasitol, although I can’t be positive. I took this suppliment twice daily all the way up until week 24 of my pregnancy, My insulin resistance and blood sugar was measured before conception, and sugars came back normal, insulin came back high, so I know I was insulin resistant to begin with. I was diagnosed with gestational diabetes at week 12, and have struggled with my numbers ever since, even while taking Ovasitol religiously and eating a better diet. I saw no change in my blood sugars. I was still bouncing between mid 90s and low 100s for my fasting sugars and getting into the 120s-130s post meals regardless. A few days after I stopped taking Ovasitol, I started eating 1 tablespoon raw virgin unrefined coconut oil each day. It has been a few weeks since I made this change, and since then my fasting numbers have dropped to mid 80s to low 90s every morning, while post meal numbers continue to improve. I can’t say that this will continue to be a solution, since I know hormones will change the closer to our due date, but in my case, I really haven’t seen any benifit from taking Ovasitol. Sorry, we only ship to customers in the US and Canada. Hi, I was diagnosed with pcos when I was 16 and was on and off the pill for years. At 30 I decided I wanted a baby and stopped all contraception and was able to get pregnant within 10 days. I am now 41. I have been on metformin for years and have regular periods and I am ovulating. My husband and I are not really trying for a baby but not not trying for a baby. I have just started inositol in the hopes that I can become pregnant hopefully soon. Has anyone had luck with being on inositol and metformin or is it better to just take one? I just want to post about my personal experience with Ovasitol because I am so grateful to have found out about its benefits when I did! I was diagnosed with PCOS when I was 18 years old, and I was on birth control for about 10 years after that. I was married in 2015 and stopped taking birth control in July 2015. After that, my cycles were completely unpredictable, ranging from 40-90 days between periods. I tried metformin, but I had terrible stomach upset and still did not have consist cycles, so I gave up after about 5 1/2 months. I heard about Ovasitol from reading blog posts and decided to give it a try. I began taking Ovasitol and prenatal vitamins daily in August 2016. I FINALLY had some consistency in cycles after about 2 months on the supplement. My cycles improved to about 40-45 days, and I just felt better overall! I began tracking my temperatures in November 2016, and after our FIRST attempt my husband and I conceived! I truly believe this has everything to do with Ovasitol and my own diligence to understand my body and PCOS. I am amazed and beyond thankful for this product! I believe everyone with the diagnosis of PCOS should give it a try! It is a breakthrough treatment, and it is unfortunate that it is not more well-known at this point. Fantastic Kristen! We are so happy for you! Best wishes for a healthy pregnancy! Does it help with weight loss? Amy, there are some studies that show inositol can result in weight loss and decreases to waist circumference but it’s not recommended as a weight loss supplement. 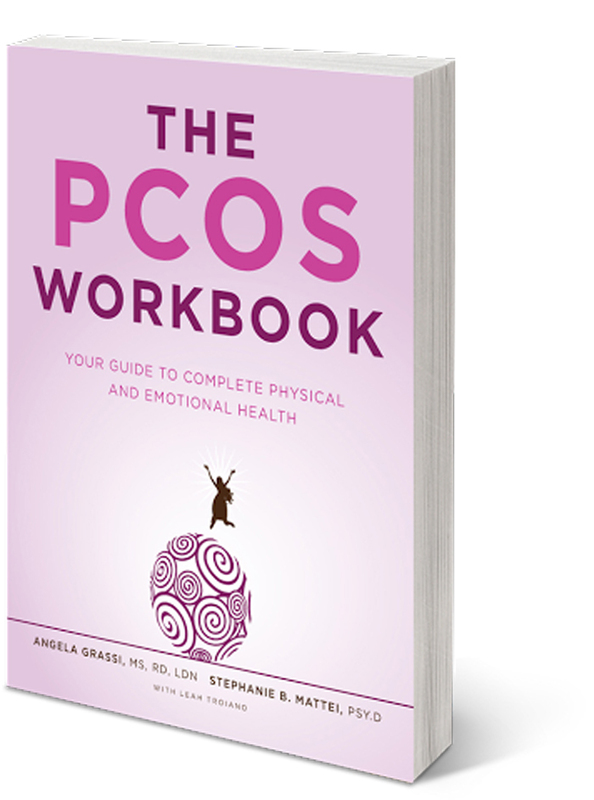 Having been diagnosed with PCOS at 17 (I’m now 32) it frustrates me to no end that I have only been prescribed the OCP, Metformin or Aldactone. This looks very promising to me! I am blessed to have three children and I’m not, nor have I ever been overweight. But, I have excess hair on my face + have had acne since I was 11. Will this help? Yes, inositol like in Ovasitol has been shown to reduce acne and lower testosterone. Worth a try! Yes, you can take ovasitol and metformin together. Best of luck! Maltodestrine, Myo-Inositolo, Ossido di Magnesio, Acidificante: Acido Citrico, Aroma, Edulcorante: Sucralosio, Vitamina B3 (Nicotinamide), Ossido di Zinco, Vitamina D3 (Colecalciferolo), Agente antiagglomerante: Biossido di silice, Vitamina B5 (Calcio D-Pantotenato), Vitamina B12 0,1% (Cianocobalamina), Vitamina B2 (Riboflavina), Vitamina B6 (Piridossina Cloridrato), Vitamina B1 (Tiamina Cloridrato), Acido Folico (Acido Pteroil-monoglutammico), Selenito di Sodio. It contains myo-inositol … I’m on metformin for several years now and when I started to get this product changes my menstrual cycle completely! Can myo-inositol act differently on other persons? Rita, most women see a positive change in their cycle. Worth a try! My experience with Ovasitol has been worse than metformin. With metformin I had some nausea & diarrhea when i first started & as I titrated myself to the prescribed dose of 1500mg but it only lasted a day or two. afterwards titration was over I had no issues. I thought I’d give ovasitol a try since most online pcos sites rave about it & there were “no side effects.” Wrong! i had worse bloating of my life,smelly gas, cramps, headaches, & horrible diarrhea. Supplements are not regulated & these people are marketing geniuses. I will stick with my metformin over ovasitol any day. It helped me ovulate & I don’t have to worry about sharting on my partner while it was babymaking time & I feel sexier when I don’t feel like a bloated whale 24/7. We’re sorry you experienced side effects from Ovasitol. Most people do tolerate it well with minimal or no side effects. Hi, I just wanted to clarify whether I can take Inositol as well as the Metformin? I can only tolerate 500mg Metformin a day. Yes, you can take both together. I am just learning about the significance of supplements in my (long) journey TTC. Ovasitol does sound like a promising alternative to Clomid/Metformin. Can it be taken in conjunction with some other supplements I’ve been reading about (Tribulus, Vitex, Conceptions Tea, etc. ), or should it be taken alone? The information out there is overwhelming, and I don’t want to end up doing more harm than good! Any insight you can share would be much appreciated. Ye, you can take Ovasitol with other supplements. The inositol in Ovasitol has good research. Those other supplements not so much. You may want to start with Ovasitol and see how you do and how your body responds before starting the others. So I havent had a period in 10 months. Since 4 months I’ve been taking inositol (more or less 4grams a day, 2gr in morning and 2 gr before sleep, both on a empty stomach).Today I’ve had my first period!!! And it’s a real one (not just some brown discard). For real there were times I thought it might never come back. Im 25 years old, not overweight at all, have a healthy lifestyle and diet, been studying (and using) supplements for years and really have no clue where it came from. .. Some other supplements I took along were: B vitamin complex, flaxseed, zinc, magnesium and diatomaceous earth. I started doing yoga everyday about 4 months ago and did a full parasite cleanse some weeks ago, don’t know if that has anything to do with it though. Anyway I wanted to let you know because am absolutely sure it was the inositol that did the the trick. I’m one of those few who’s not interested in having a baby or anything and also didn’t fit the criteria of “pcos patient” (only had few of the symptoms ). Maybe I just had to connect more with my female side and I”ll keep on working on that. Good luck to you all, everyone has the capacity to heal themselves! ! Hi so I was diagnosed with pcos over 10 years ago and have been ttc for just over 8 years. No births, no losses and I’m just now taking control over my weight. I’m 31 and I’m determined to lose 100lbs. I have 1000mg myo inositol pills and I’m trying to figure out what the difference between all the other inositol supplements are. It seems like all the research I do takes me no where. Ive always been irregular and never know if or when I ovulate so not only am I wanting to take myo inositol for that but to lose weight. Any advice or suggestions appreciated. 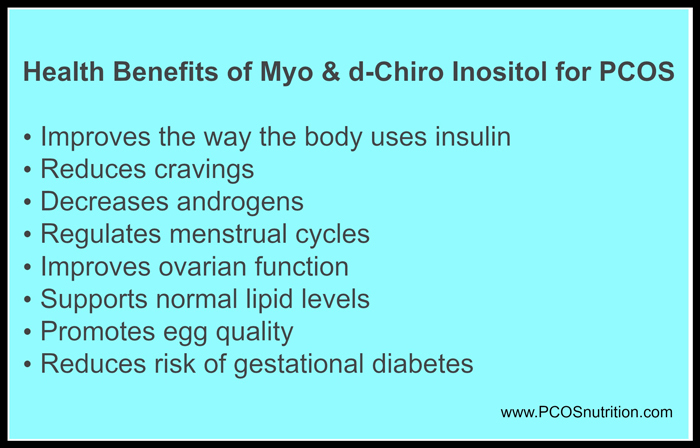 A combination of Myo to D-chiro inositol in a 40:1 ratio can help regulate cycles, promote ovulation, and reduce insulin. We recommend Ovasitol which has this ratio. Here are some articles about it. For best results, take 2 grams of myo (or one packet of Ovasitol) twice a day with food. Let me know if I can answer any questions for you! I have pcos. I don’t wish to have any more children. I have struggled with weight all my life. I seem to have to diet and workout twice as much as anyone I know, will ovasital help me with the weight loss? Or do u have a better solution? I was diagnosed with PCOS at age 18, I am now 28 and I am trying to conceive. I have changed my diet and began exercising atleast three times a week and have noticed some changes in my menstrual cycle. They have been been consecutive for the last five months, but my cycles went from 31 days to now 41 days. Would I have to take this with anything else? It’s hard to say what else contributed to your delayed cycle this month-stress, lack of sleep, exercise and diet can all affect it. 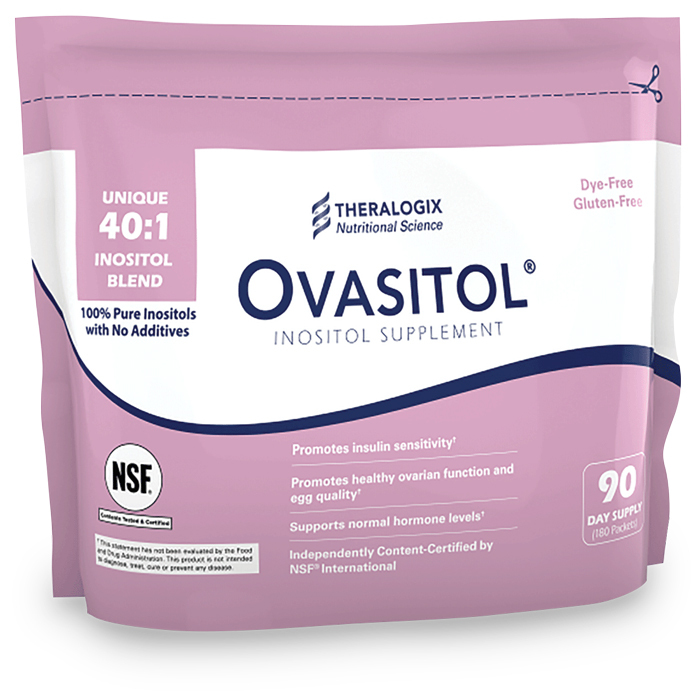 Ovasitol has shown to improve menstrual regularity. Is there any impact on the liver? So in PCOS patients with liver disease, will it further tax the liver? Thanks! No, it is a relative of the b-vitamins so water soluble, not toxic to liver. Hi I follow posts and suffer with PCOS. Unfortunately have been suffering for years and now 30. I have tried Inofolic for 3 months and recently started Ovasitol. I haven’t unfortunately had any improvements – still don’t have regular periods and have tried clomid, letrazole and had no luck. I don’t ovulate. IVF is the only option left for me which I am struggling to go for due to weight gain. My question is Ovasitol – how long shall I continue using it for – from your experience before I see any benefits. I have already use 3months supply , I know this varies from person to person but I am very desperate and not sure if I need to continue. It is very pricey but I am willing to try anything at this point. Also used metformin in past but not seen any change. Are there are evidence to show Ovasitol and metformin working well together? Hi Sarah, every woman is different. I am sorry you haven’t gotten your period yet. There are so many factors that affect ovulation. Ovasitol can still improve egg quality so if you do go the IVF route, you may have some good eggs! You could give Ovasitol another 3 months. Other things to look for with Ovasitol is a reduction in HA1C levels, cravings, improved hormone levels. Hope this helps! Could one take ovasitol and metformin simultaneously? Yes, you can take ovasitol and metformin together. If Ovasitol not available then what to do to treat the symptoms of PCOS.? can i take metformin and ovastitol altogether? yes, you can take metformin and Ovasitol together. Can i mix ovasitol with grapefruit juice or sprinkle it over my food? You can mix in grapefruit juice but needs to be dissolved in a liquid, not sprinkled. Hi! I have lean PCOS with normal fasting insulin and blood sugar, taking 1000mg of metformin for help with ovulation. 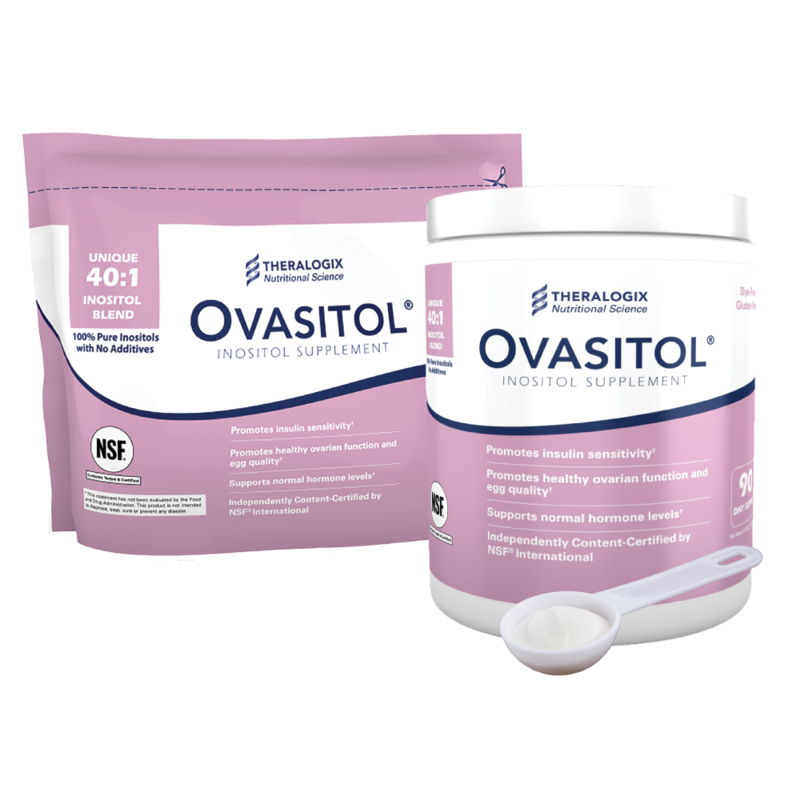 I just ordered ovasitol after reading a lot about its success with help in ovulation for PCOS patients. I saw that you take them concurrently? How much ovasitol do you take? My concern now is my doc wants to put me on metformin to reduce chances of miscarriage, but I don’t want to go off ovaistol. I know you’ve mentioned quite a few times it’s ok to take both but I’ve read conflicting info. Many people say it can have additive effects as the two function similarly. Can you tell me a bit more on the research/Info about how it’s safe to take them together? Yes, you can take Ovasitol at the same time as metformin. They work differently. You may also want to ask your doctor about letrozole as it has been shown to be superior to clomid for PCOS women. I have a luteal phase defect along with being insulin resistant… I take Bio identical progesterone because I’m suffering from hair loss, extreme fatigue, severe muscle aches and severe acne! I was taking inositol and did see a dramatic difference…. I’m thinking I should take it again because I think I’m suffering from peripheral neuropathy because I have severe sensitivity in my hands and feet, I also have tingling ,I’m very tired and weak a sense well. Hi there. 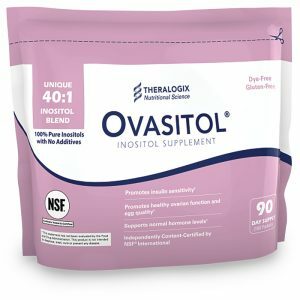 Where can one find ovasitol in South Africa? Or can couriers be done to SA? Contact Theralogix the makers of Ovasitol directly. Can I take the Ovasitol along with the Berberine?